Learn more about the diocese, our mission and our staff. Applications are being accepted for the full time position of Director of Development for the Diocese of Rapid City. FUNCTIONS: The Director plans, organizes, implements and evaluates all philanthropic activities for the support and benefit of the Diocese of Rapid City including but not limited to the Annual Appeal, Annual Giving Society, Estate gifts and special needs gifts. The Director is responsible for grant applications and the management of fundraising programs. Ensures all activities are conducted in support of the mission, philosophy and values of the Diocese of Rapid City and the Roman Catholic Church. Supervises and trains a Grant Writer and the Assistant to the Director of Development. QUALIFICATIONS: Bachelor’s degree in business administration or related field. Knowledge of effective fundraising strategies and techniques for small to medium–sized nonprofits. Experience building and maintaining a contact management system of donors in which planned donor contacts are initiated from the development office based on capacity to give and affinity with the diocesan activity or program. Self-starter, good communication skills, experience in public relations, strong interpersonal relationship skills. Demonstrated success with planned giving programs. Demonstrates proficient computer skills and familiarity of Microsoft Office software applications including Outlook, Word, Excel and PowerPoint. May also require the ability to use Access, and desktop publishing software as required. Ability to learn and effectively use various data collection and database management systems to record data as required. Demonstrates familiarity and proficiency with Internet tools and techniques for searching, extracting and processing information. Click here for a full job description. St. Bonaventure, McIntosh, 100th Celebration, Sunday, July15, 2018, 10:30 a.m. Mass, followed by potluck lunch. Please bring a salad or dessert. The Catholic church in McIntosh began as a mission of the Lemmon parish in 1908. Parish records show the first Masses were said December 22, 1908, and December 15, 1909. Masses were held in the courthouse or other available buildings. Baptisms were done in family homes. In 1911, the parish was served by the Benedictine priests and attended by Ft. Yates, N.D, with a mission at McLaughlin and other Indian missions of the Dakotas. The first diocesan priest was assigned to the area in 1916. The Benedictines purchased land for a church and a home at the end of the block was bought for a rectory. The lots between the home and parish were gifted to the church by a parishioner. Around this time, land for the cemetery was donated. Construction began on the orignal St. Bonaventure Church in the spring of 1918 and was completed that summer. The final debt of $1,556.87, was paid in 1924. The first resident pastor was also assigned to the church that year. From 1930-1943 many improvements were made to the church and a home was purchased and moved across the street for the rectory. In 1962, Frank Lang, a long-time parishioner, was the first to put a shovel into the ground for the new church. Lang, a trustee in 1918, participated in ground-breaking of the original parish 45 years prior and was one of six surviving charter members of the parish. In the years following Vatican II, a renovation project was completed which included the addition of a smaller chapel for daily Mass. A Catechetical Center was built in 1970. The building housed the living quarters for the parish priests and classrooms for religious education and church activities. The old rectory was sold and moved to another part of town. According to a West River Catholic article, remodeling the interior of the parish was discussed as early as 1988 and again in 1994. In 2000, a parish-wide appeal was launched to help pay for the renovations and after a grant from the Extension Society work began on the church. The building was made handicap accessible, a gathering area was added, and the sanctuary was opened up allowing for all the stained glass windows to be viewed. The church rededicated on November 4, 2001. Effective July 1, the combined Offices of Vocations and Stewardship will be separated, with Fr. Mark McCormick retaining the Vocation Director duties, and his administrative assistant, Hanson, becoming the Director of Stewardship. “My role is to be of service to the churches,” said Hanson. The Diocese of Rapid City is currently advertising for an assistant to work with both offices. Hanson has worked in the Vocations and Stewardship Office for the past three years. She is a graduate of the University of Wyoming, Laramie, Wyo., with a degree in personnel administration (human resources). Her prior work has included a number of part-time positions. In addition to working in personnel administration, she has done bookkeeping for homebased businesses, medical billing and tutoring of students in reading and spelling. She also ran a child care business. “Most of my energy and my primary focus have been on my family,” she said. The second part of the department’s agenda according to Hanson is a component of Bishop Robert Gruss’ Diocesan Priority Plan, Through Him, With Him and In Him. It calls for identifying Stewardship Parishes. To do that the Stewardship Office members assembled a group of parishioners from urban and rural churches to define “Characteristics of a Stewardship Parish.” The ideas became a booklet which outlines the attributes of a Stewardship Parish as well as self-assessment tools for parishes to use to help ascertain their strengths and weaknesses in the area of stewardship. Churches are enlivened beginning with the first phase — Foundational Parishes. “It means looking through our three lenses of stewardship — Hospitality, Faith and Discipleship,” she said. Currently, Our Lady of the Black Hills Church, Piedmont, has been designated a Foundational Parish. It is now working through the second phase, looking at Generous Hospitality. Council members are finding their strengths in this area and the ways they would like to grow. St. Patrick Church, Lead, and St. Ambrose Church, Deadwood, as well as St. John Church, Ft. Pierre, are close to becoming Foundational Parishes and three others are looking in to it. Foundational Parishes have active Finance, Pastoral and Stewardship Councils. They have clear mission and vision statements with goals for all areas of parish life; and they have an up-to-date census. These parishes follow the norms outlined by the diocese for financial record keeping and reporting. They have effective means of communication and parishioners take responsibility for parish programs. Once Parish Finance and Stewardship Councils review the assessments and determine their church’s strengths and weakness, they talk to the Diocesan Stewardship Office staff. “We help them set goals,” she said. At the end of May, the Office of Vocations was busy preparing for another summer of Duc In Altum — “put out into the deep” (Lk 5:4). We trained two teams of four and one team of five young adults, sending them out as missionary disciples, to crisscross the diocese evangelizing and catechizing our children, youth and families in the tradition, beauty and the richness of our Catholic faith. The teams will focus on the Apostles Creed and Luminous Mysteries of the Rosary this year. In addition to giving them information on the topics they will teach, we spent time with our young adults cultivating their interior life through the heart of St. Ignatius Loyola by teaching and accompanying them in some of his prayer practices; meditation and contemplation of the Scriptures and the Examen prayer. The Examen is a method of prayer that Ignatius of Loyola taught in his “Spiritual Exercises.” It is a method of prayerful reflection on the events of one’s day in order to take notice of God’s presence and how one responded in generosity or held back on the movements of the Lord in one’s heart throughout the day. This prayer also offers us the opportunity to look at those choices one has made that are not of God. Transition: I become aware of the love with which God looks upon me as I begin this Examen. Step One: Gratitude. I note the gifts that God’s love has given me this day, and I give thanks to God for them. Step Two: Petition. I ask God for an insight and a strength that will make this Examen the work of grace, fruitful beyond my human capacity alone. Step Three: Review. With my God, I review the day. I look for the stirrings in my heart and the thoughts that God has given me this day. I look also at those that have not been of God. I review my choices in response to both, and throughout the day in general. Step Four: Forgiveness. I ask for the healing touch of the forgiving God who, with love and respect for me, removes my heart’s burdens. Step Five: Renewal. I look to the following day and, with God, plan concretely how to live it in accord with God’s loving desire for my life. Transition: Aware of God’s presence with me, I peacefully conclude my Examen. St. Ignatius says he becomes aware of the love with which God looks upon him as he begins the Examen. I love this part of the prayer, in which we allow God the Father not only to look upon us, but to gaze upon us. I don’t even like to look at myself in the mirror, however, this is not so with God. God looks upon me with love. John of the Cross says: “The look of God is love and pouring out of gifts.” Ignatius says before beginning the Examen prayer we should pause for the time it takes to pray an Our Father, allowing God to gaze upon us (Spiritual Exercise, 75). If you have never prayed the Examen, or have been lukewarm in its practice, I encourage you to give it a try this week. It is right in line with the lens of lively faith: prayer, study, and formation in our stewardship initiative. The Examen prayer also roots our lives in gratitude, which is the foundation of living Stewardship as a Way of Life. Father Gallagher shares that this prayer can be prayed individually and together as a family. He recounts how a father and mother, with their four young children, pray a family Examen together. I would be curious to hear your experience in praying the Examen prayer — individually or with your family. St. Ignatius, pray for us! Last October 21st was an important day in the history of the Diocese of Rapid City. On this day, during the celebration of the Mass at Holy Rosary Church in Pine Ridge, a decree was read formally opening the cause for beatification and canonization of Nicholas Black Elk, Sr. I would like to update you on what has happened since that momentous day. At the November 2017 USCCB meeting, as required by canonical procedures, I made a presentation to the American bishops seeking their prayerful support to move forward the process for beatification and canonization of Nicholas Black Elk. Following that procedure, their unanimous approval was made public and since then I have been amazed and inspired by the interest in this cause from all across the country and throughout Europe. Since the opening of the cause, I have received a number of letters and phone calls from people in various parts of the country sharing with me the impact or influence that Black Elk has had in their lives as they have studied his life or through intercessory prayer. In addition, numerous film producers have contacted me expressing interest in creating a film or documentary on his life. In recent months, we have secured a postulator in Rome, Fr. Luis Escalante, who is experienced in working with the process and procedures and the Congregation for the Causes of Saints, bringing an expertise that is not available locally. Bill White of Christ the King Parish in Porcupine will assume the role of Vice Postulator. Part of the process is to formally appoint the Officials of the Inquiry. Fr. Joseph Daoust, SJ, has been appointed Episcopal Delegate, Fr. Dan Juelfs as Promoter of Justice, and Teresa Spiess as Notary. To assist in searching out and gathering all the published writings of the Servant of God Nicholas Black Elk, those not yet published, as well as all historical documents, a Historical Commission is appointed. Members of this commission are Mark Thiel, Archivist at Marquette University where many records about Nicholas Black Elk are kept; Fr. Michael Steltenkamp, SJ, author of two books about Black Elk — “Black Elk: Holy Man of the Oglala,” and “Nicholas Black Elk: Medicine Man, Missionary, Mystic;” and Ken Stewart, Archives Research Administrator for the South Dakota State Archives/South Dakota State Historical Society. Two Theological Censors must also be appointed. Their role is to examine the published writings of the Servant of God — his own works or by others — to verify that there is nothing contained in them contrary to faith and good morals. The names of the Theological Censors must remain secret. An important aspect of the cause is to verify the heroic virtues and the reputation of holiness and intercessory power of the person being considered for beatification and canonization. This takes place through the testimony of witnesses. These include eyewitnesses, that is, those who have had direct and immediate knowledge of the Servant of God, i.e., blood relatives and other relations as well as others who have received information about Nicholas Black Elk from those who have had direct and immediate knowledge. The witnesses are bound by an oath to tell the truth and to keep secret their role in this process. There are other particulars that are a part of the process, but because of limited space here I have outlined the basic process. In the coming months the Officials of the Inquiry will be completing their work, bringing together all of the required documentation — Acta (Acts) — necessary to move this cause forward. Upon completion, the Acta are then sent to the Congregation for the Causes of the Saints. Then the diocesan phase of the process is completed. An important aspect of this whole process on a local level is cultivating an interest in the life of the individual being promoted for the cause of beatification and canonization. This has begun in our diocese with the prayer cards and the posters of Nicholas Black Elk highlighting some aspects of his life. A website is being developed to promote his cause as well as provide historical information on his life. A Facebook page promoting the cause will also be up and running in the near future. This is an important opportunity for the Diocese of Rapid City. I would ask that you keep this cause in your prayers. If you have not already begun to do so, please use Servant of God Nicholas Black Elk as an intercessor in your lives. We never know how the Lord will use those prayers of intercession. On this page is the prayer that has been created for this process. Hopefully it is found on prayer cards in your parishes. Let it find its way into your daily prayer life. I believe that the church’s special recognition of Black Elk’s saintly life will provide the Native American faith-community and peoples everywhere the example of a very special person whose presence to others is worthy of imitation. As a model, he showed how the Native American culture could enrich the Body of Christ, integrating the two traditions, thereby bringing a richness to both. This Catholic missionary and mystic holy-man of the Oglala Sioux would be a welcome symbol to all Native Americans, leaving a legacy of someone who sought the Sacred, who lived the Gospel in everyday life, and who inspired others (Native and non-Native) to do the same. 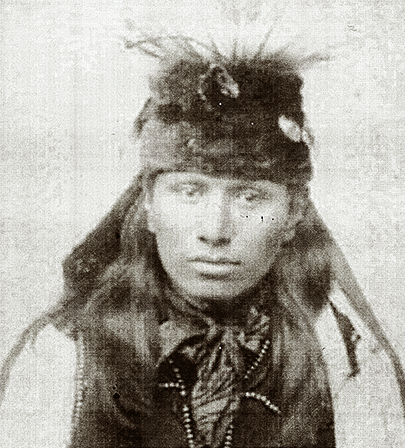 Servant of God Nicholas Black Elk, pray for us. Heavenly Father, Great Spirit! Behold us, who stand before you singing our song of thanksgiving for Servant of God, Nicholas Black Elk. Faithfully he walked the Sacred Red Road and generously witnessed the Good News of our Lord Jesus Christ among the Native American people. We humbly ask you to hear the prayers we plead through his intercession. We ask Holy Mother Church to recognize his sanctity by acknowledging his presence among the company of Saints and as one to imitate in his zeal for the Gospel. Open our hearts to also recognize the Risen Christ in other cultures and peoples, to your glory and honor through Christ our Lord. Amen.